Fumonisins – a group of toxic and carcinogenic fungal metabolites commonly found in corn (maize) and its by-products – pose a significant threat to swine production, according to Shu Guan, Biomin Technical Manager. Recent scientific developments regarding detection and treatment are set to revolutionise mycotoxin risk management. Pig diets rely heavily on corn (maize) and its byproducts such as dried distillers grains with solubles (DDGS) and corn gluten – all a major source of fumonisin contamination in feedstocks. The latest Biomin Mycotoxin Survey results, based on thousands of commodity feedstock samples taken worldwide, show fumonisin contamination occurring in many at levels that pose real health threats to swine, especially piglets and sows (Figure 1). Figure 1. Global fumonisin occurrence above the risk threshold (>750 ppb). Fumonisins are known to inhibit the biosynthesis of sphingolipids, induce hepatotoxicity, possess renal toxicity and elevate serum cholesterol concentrations in most animal species (Colvin et al., 1993). In swine, fumonisin contamination is associated with Porcine Pulmonary Edema (PPE) (Haschek et al., 2001). Heavy, wet lungs with widened interlobular septa as well as fluid in the airways and the thoracic cavity are often identified in this case (Harrison et al., 1990). An increasing number of cases of PPE which relate to fumonisin contamination at two to three parts per million (ppm) in corn have recently been reported in south-eastern and southern provinces in China. Fumonisin contamination in swine is difficult to detect mainly because it tends to occur at subclinical levels – necessitating measurement of the sphinganine/sphingosine (Sa/So) ratio, a scientifically-recognised biomarker for identifying fumonisin exposure in pigs. Though often overlooked, long-term ingestion of fumonisins can cause chronic effects and immune suppression (Casteel et al., 1993), representing real economic loss for farmers due to increased disease rates and reduced animal performance. Low doses of fumonisin B1 at 0.5mg per kg bodyweight per day can reportedly increase susceptibility of pigs to pathogenic E. coli strains, Pseudomonas aeruginosa and Pasteurella multocida (Halloy et al., 2005). Fumonisins are also known to increase the susceptibility of pigs to Porcine Reproductive and Respiratory Syndrome (PRRS), decrease antibody titres against Aujeszky’s disease, decrease phagocytosis of Salmonella typhimurium in alveolar macrophages and impair production of antibodies against Mycoplasma agalactiae (Marin et al., 2006; Moreno et al., 2010; Posa et al., 2011; Stoev et al., 2012). To combat mycotoxin contamination, legislative caps on the allowable amount of mycotoxins in animal feedstuffs have been introduced (Table 1), although regulations are still pending in many countries. Yet, these guideline and regulatory levels are very much based on policy considerations instead of animals’ tolerance to mycotoxins and their harmful effects. In real farm scenarios, animals are often confronted with other interacting factors and challenges. 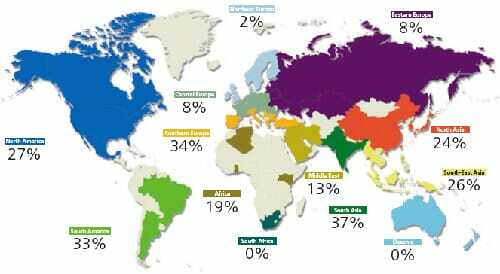 which increase their susceptibility to mycotoxins. Furthermore, the presence of multiple different mycotoxins poses further harm to animals. For these reasons, it is common to see animals in the field negatively affected by mycotoxins at levels below legislative thresholds. Drawing upon several decades of worldwide practical experience in the field and scientific trials conducted to mimic field situations, Biomin developed a set of risk levels of fumonisins in swine as a practical tool for the industry (Table 2). Binders are compounds that adhere to toxins thus reducing the amount of toxins that can enter an animal’s bloodstream – a neutralisation process known as adsorption. For over a decade, mycotoxin binders have been commonly employed to prevent mycotoxicosis. While binders work in some instances (aflatoxins, one class of mycotoxins, can be adsorbed quite efficiently), they are less effective or ineffective against certain types of mycotoxins such as zearalenones or trichothecenes. In the case of fumonisins, no adsorbent materials have been identified thus far that are proven to bind fumonisins effectively (Solfrizzo et al., 2001; Piva et al., 2005; Avantaggiato et al., 2005; Biomin Guide to Mycotoxins, 2012). Binders incur two significant drawbacks. First, adsorption is reversible, meaning that bound fumonisins can be cleaved (released) and thus pose an active threat to animal health. Second, binders are highly pH-dependent. While binders can be shown to be effective in a static laboratory setting (indeed, some have high adsorption rates of fumonisins in buffer solutions with stable pH levels), they have shown considerably less effectiveness in conditions that mimic an animal’s gastrointestinal tract. In these more realistic simulations, toxin adsorption effectiveness fell by more than 50 per cent, largely due to the fact that most binders have shown an extremely low binding capacity of fumonisins at pH values of 6 and 7. As a consequence, most fumonisin that is bound in the stomach would be released in the intestinal juice, posing a risk to animals. Until quite recently, binders were essentially the only way to combat fumonisins. Now, a new method has emerged: enzymatic biotransformation. Through 10 years of scientific investigation, Biomin developed FUMzyme® – the first purified enzyme that transforms fumonisins into non-toxic metabolites and the only product of its kind authorised by the EU. FUMzyme converts fumonisins into non-toxic hydrolyzed FB1 (HFB1). Scientific research indicates that HFB1 does not cause intestinal or hepatic toxicity in the pig model and does not induce major changes in the sphingolipid metabolism (Voss et al., 2009). Biotransformation via enzymes has four clear advantages over traditional binders. First, biotransformation is irreversible, so it does not succumb to binders’ primary drawback. Second, enzymes used for biotransformation are not hampered by the GI tract. Third, FUMzyme is a specific solution designed to counteract fumonisins. Fourth, FUMzyme has proven effectiveness. In-vivo pig trials in Austria, Brazil and France have demonstrated the beneficial effects of Mycofix® Focus (containing FUMzyme and bentonite) in counteracting fumonisins. 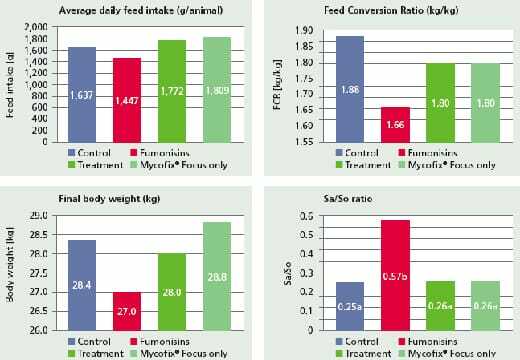 In a recent trial conducted in Korea, the application of Mycofix Focus alleviated 5ppm of fumonisin effect on feed intake, bodyweight gain and FCR within 42 days (Figure 2). A biomarker for fumonisin exposure, phinganine/sphingosine or Sa/So ratio, reached elevated levels in the fumonisins group (P<0.05) on day 42. Treatment reduced Sa/So ratio to the control level, which demonstrates the efficacy in controlling fumonisin toxicity in vivo. Figure 2. Effects of FUMzyme on growth performance and Sa/So ratio in pigs after 42 days. Fumonisins are highly prevalent across the world, particularly posing a threat in Asia, South America and Southern Europe of late. While binders have proven effective in combating some types of mycotoxins – particularly aflatoxins – they are considerably less effective against fumonisins and others. Thanks to recent scientific developments, enzymatic biotransformation offers a unique, specific and irreversible way to counteract fumonisins.